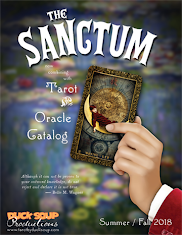 So many Lenormand decks are doggedly literal. Too literal for my taste. On the dog card, a picture of a dog. On the ring card, a picture of a ring. On the mountains card, a picture of a mountain. It's frankly boring to me. Lenormand readers may prefer the simple approach, but as a designer I'm constantly looking for ways to do things differently, if for no other reason than to keep myself from dying of boredom. 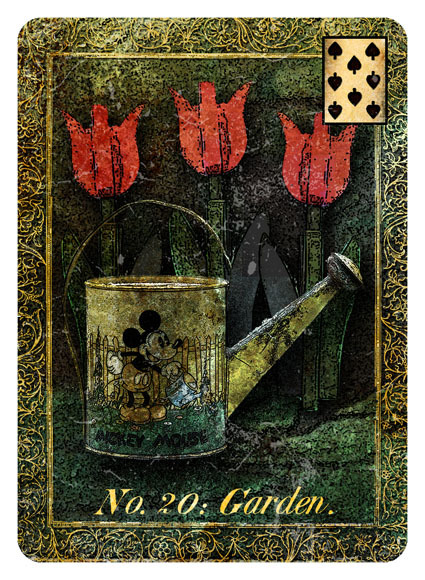 I think that's evident throughout Tinker's Damn Lenormand, but nowhere is it more evident than on this card -- which is considerably toned down from my first idea. I knew that idea wasn't going to fly with a lot of potential customers. 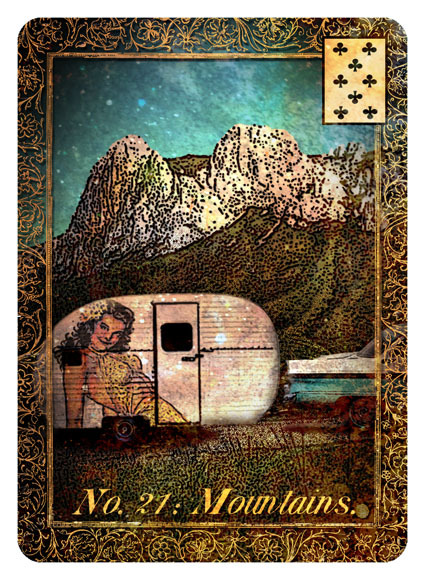 So I compromised and gave the literalists their mountain range -- meanwhile applying my '50s pin-up girl onto the side of a caravan. The result is just a little bit wicked... the kind of wicked I like best. Well... I didn't make it up. Any Monty Python fans out there are likely to remember Michael Palin's narration over footage of a certain mountain range: "The Grrrrrand Tetons! The Mountains with the biggest _____ in the world!"